Photos of Nick by various photographers, reprinted with permission from Nick Wright. Like thousands of other viewers, I happened upon teen bodybuilder Nick Wright on Youtube, where his videos provide workout tips and coverage of his natural bodybuilding competitions. This 19-year-old dynamo, who started working out at age 14 and began competing when he was 15, impresses not just because of his muscular physique and male model looks. He also has an amazing presence in front of the camera as he speaks, and a well-articulated enthusiasm for natural bodybuilding; a natural celebrity with an increasingly large following. Nick spoke with me about how he started, how he stays in shape, and what his goals are. He is so detailed and enthusiastic about sharing, that this will be a two-part interview. The photos here show his progress through the years, as well as some recent professional modeling shots. We’re now talking about collaborating on a photo/video shoot, so with any luck I’ll have some fresh images of this dynamic teen bodybuilder. You started bodybuilding at age 14. What got you interested in bodybuilding? At 104lbs, I was TINY [during] my freshman year of high school. I was packing an embarrassing 11.5" biceps, pumped. I had very narrow shoulders, a short torso, and long, narrow limbs. 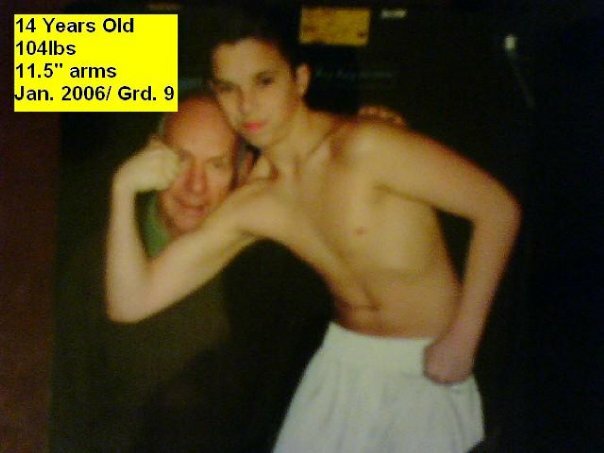 I always had genetic stand-out points such as the peaks on my biceps which I could always manage to get attention from even as early as 10 years old. My traps were always pretty defined from the start, but I was delusional. I literally saw myself as having a great bodybuilding physique when I had less of a build than my little sister! I was always into it, and somehow managed to get attention for my "body"... I suppose at 13 the competition around you isn't so drastic anyway. What was a defining moment for you in your pursuit of the perfect body? One day, on January 16th, 2006, I was watching an MTV Show called “True Life” on obtaining the perfect body. Seeing a guy push his body toward his goals and tracking progress inspired me to begin doing so, that very day. That night I began Googling various bodybuilding-related names like Mr. Universe and Olympia, not even knowing the difference or what they were. I was blown away by the dudes on there, Ronnie was the current 8x champ at that point. I printed some photos to post on the wall, and the rest was history. Having done various sports, and never falling in love with any, I wanted something I could be passionate about — something I could take pride in, and carry a passion for the trophies earned. I wanted to jump into a show as soon as I could! If we are talking about physique, the list goes on when it comes to proud turnouts, since my entire physique was lacking. As far as facial features/looks go, my eyes take it. I have the Native American, pronounced cheekbones to compliment them as well! On my physique, my arms — biceps in particular — take the cake, followed by my legs and back. My arms were way too small when I began, so I became obsessive about turning them around. Now I am often told they are the leading muscle group in my physique. My legs, however, are the eye catchers on-stage. I have excellent genetics when it comes to the wheels. I actually only train them once every other week at certain points during the off-season, so they do not overrun my upper body. My back is another favorite as well. What is the most exciting part of competing? I cannot honestly think of one thing that is NOT exciting about it. That final week, watching your body transform, finally getting to apply the tan, playing with the water... Just seeing it all unravel in front of you, everything you have been working on the past few months. Then there is the entire backstage environment. The intensity, which later turns into camaraderie between the competitors. Seeing everyone completely bundled up, getting your imagination running on how much better they might look than you. Then, of course, the pure adrenaline rush you receive when YOU peel down, and see how sick YOU are looking! And nothing beats the feeling of just being on-stage demonstrating everything you have been working for at this point! To see more of Nick: http://www.youtube.com/user/scondore (and stay tuned to modelJOCK.com for part 2 of the interview, with more photos and video links).